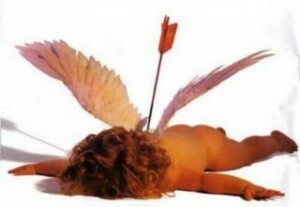 Good News- you DON’T have VD! My friend Amy is in a long distance relationship. Sure it’s tough, but they are working on a solution that hopefully comes to fruition this spring. You know what he did? He didn’t waste money on chocolates or flowers that will be consumed and forgotten. He got on a plane, and flew 1500 miles to show up on her doorstep. It doesn’t matter if it’s Valentine’s Day, or Tuesday. He was his gift to her. And as soon as spring, he will be again, every day. So WHO actually likes VD? The disease or the “holiday”? Either way you are screwed, and not in a good way. Well, with the former it may have started as a good screw… but I digress. Single Men: Avoid girls around this time at all costs, for fear of being roped into the hype. Meanwhile unable to get laid during this time due to said fear. It’s a shame, really. Single Ladies: It is torture being reminded at every turn that you are alone. The grocery stores, the emails pimping products, the jewelry commercials, it goes on and on. Attached Women: This is the only segment of the population that possibly enjoys this “holiday”. Which is sad really. Being showered with overpriced flowers and chocolates. Really? You should be cherished by your lover every day, not just because Hallmark says so. We’ve all heard the theme song from Golden Girls a million times over. Or is that just me because I’m destined to be a crazy cat lady and watch it every night before going to bed?? Ohhhhh but I digress…. It seems so strange that while polar opposite, I can relate to both messages so clearly. Why is it that some people you call friends would drop you in a heartbeat if they had something to gain from it? Why is it that some friends never ever make the first move, be it a phone call, a text, a plan to meet up? Why do others drop EVERYTHING for you no matter what, without hesitation? Are these qualities in a person’s true character? Or is it related to the friendship itself? I feel like I have so many questions and no answers. I feel heartbroken that I never got an explanation from a “friend” who RSVP’d to my birthday party, yet never responded to the texts I sent that day explaining details, and never bothered to showed up. Not even sending a text with a lame excuse as to why they couldn’t make it last minute. And never bothered with a call or text on my actual birthday. But then I also feel overwhelmed with love and joy when I realize who my friends are and who would never leave my side. The ones we laugh til we cry with, drink til we cry with, or fight til we cry with. Are there any Groupons for Therapy Sessions? “Sam: Why do I and everyone I love pick people who treat us like we’re nothing? The movie hasn’t even come out yet, but in the trailer on TV, something resonated with me in ways I will never really be able to put into words. I have some ideas of where they originate from, but not all. Looking back on my life, I have been used and abused (not literally- I apparently have some ground to stand on) by the men in my life. And I realize, I LET them treat me like that. I’ve been the soul bread-winner, the cheerleader, the support system, and the doormat. I have never had a healthy relationship. One that is equal at give and take. It’s always give, give, give, and forgive. I’ve been cheated on. I have had a long-distance relationship choose seeing his “fan club” of 100 friends over seeing me, CANCELLING his per-arranged plans to visit me. His girlfriend. He LOVED me. Right. I’ve been broken up with on my birthday. I’ve been told “I can’t be in a relationship” TWICE by the same guy. Only for him to pick up a girlfriend in the process. BOTH TIMES. I’ve been with the selfish, the mean and the lazy. Now give me a little bit of credit. I am not with any of these assholes any more. I do not TALK to any of these assholes anymore. But it’s the fact that I ever allowed them to have their way with me and take advantage of my selflessness that has me saying enough is enough. After dating for 20-ish years. Better late than never, no? It’s not about having “must haves” or “deal breakers” when finding a partner. For me it’s about respect. I am willing to date someone that might not seem ideal, if they at least can treat me with an ounce of decency and not find a way to walk all over me. I will figure this out. It’s not going to be easy. But it’s about damn time. I deserve it.